CONRAD – Marion B., 92, of Brooklyn, Queens County passed away suddenly at home on Wednesday, November 4th, 2009. Born in Ingramport, she was a daughter of the late John and Nettie (Snair) Benvie. Marion was very family orientated and loved being surrounded by family and friends. She is survived by her husband Adrian to whom she was married to for 70 years, daughter Dolly Freeman of Greenfield, Sons Moyal (Jeanne) of Greenfield and Adrian Jr. (Christine) of Brooklyn. Grandchildren: Moyal Jr. (Suzette) Conrad of Greenfield, Peter (Michelle) Freeman of Bridgewater, Crystal (Chris) Hagen of Greenfield, Sandra (Joe) Dube of Brooklyn. Great grandchildren: Brandon and Quinten Conrad of Greenfield, Kelsey, Shelby and Kayla Freeman of Greenfield, Spencer and Morgan Hebb of Greenfield, Gabriel and Hannah Hagen of Greenfield, Piper and Loren Dube of Brooklyn. Brother Arthur Benvie of Halifax. Sisters in law: Inez Benvie of Brooklyn, Harriet Schnare of ON, Rita Benvie of ON, Janelle Benvie of Dartmouth. She was predeceased by a daughter and son in infancy, Brothers: Theodore “Ted”, Douglas, Victor and Lewis. I am sorry to learn of your recent loss and would like to extend my sincere condolences. Please know that my thoughts are with you and your family. Dear Dolly and Moyal We are sorry to hear of your Mother’s . Passing. Our thoughts and prayers are with you and family. Please accept our condolences in the passing of Your Mother, Marion. She will be missed by all who knew her. May knowing that friends care deeply, and hope it helps to get you through this difficult time. God Bless. Please accept my sincere condolences on your loss. She was a great lady. Thinking of you at this time of sadness. We wish to send our condolences on the passing of your wife/mother. She will be sadly missed. Our thoughts and prayers are with you all at this time of grief. So sorry to hear of your loss. Marion always made me feel at home whenever I came to visit, and she will be greatly missed. My sincere condolances to your family. What a loss to family and community. I haven’t seen you for years; but, you have never been far from my thoughts. I have fond memories of days and evenings spent at your warm, safe home when I was a teenager. Alf had salmon (planked, of course) for the first time at your home. The memories will be with us forever. Please pass along our condolences to the family. Our deepest sympathy in your great loss. Let memories of happy times help ease your grief. We are thinking of you. God bless. sincere condolences to you both, Dolly and Moyle and the rest of the family. To Adrian Sr. and Junior As a Home Support Worker, I did not know Marion very long but I am sure that she was a very loving and kind person . please except my condolences on your loss, you will be in my thoughts on Monday, as I have a prior commitment, I will not be able to attend her service. We send heartfelt condolences to the whole family during this difficult time. Please know we share your grief, and sorrow in Marions passing. May you find comfort in knowing so many care, and have you in their prayers at this diffucult time. My deepest sympathy to the Conrad family at this difficult time.I am thinking of you all and remember all the good time that you had together. Blessings to your family. Take care. Please know that I am thinking of you all at this time of great sorrow. Marion was a wonderful person. sincere sympathy to all the family in their big loss . marion was a great person . special thoughts go out to junior for all the time he devoted to his mom . she will be greatly missed by all of her family and friends . always enjoyed making a christmas visit with marion . she always had lots of lights and whistles . sincerely brenda and jim brooklyn . May God bless you and strengthen you; please know you are in my thoughts and prayers. Heartfelt condolences to the whole famly. Marion was a great lady and truly one of a kind. Thinking about all of you at this difficult time. 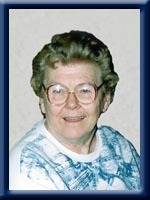 The passing of Aunt Marion has touched many. She would be pleased with the love and caring shown these past days for her and her family, and would once again bring yet another smile to her face. She will always be in my heart. Dear Uncle Adrien and Family. May God be with you all at this time . Your mother was a very wonderful person and will be missed greatly.